The FPU offers a lot of complex and powerful floating-point operations, like SIN, COS, ATAN, SQRT, etc. (SIMPLY FPU by Raymond Filiatreault has a compact overview of all FPU commands for the curious.) Use of the FPU can drastically increase what you can do in a tiny production while simultaneously keeping code size down. All x86 CPUs can use the FPU, although older CPUs (80486sx and earlier) need the FPU physically installed in the FPU socket. This guide assumes intermediate to advanced-level proficiency with sizecoding. 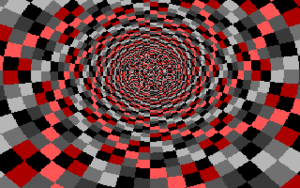 2.4 Size optimizing the "Tunnel"
That is a lot of extra code for a single integer addition, but that's a simple example; once more complex floating point operations are involved, it starts to pay off. For more advanced FPU operation, let's start from scratch with an unoptimized program which plots the distance of each pixel to the screen center as color, in 49 bytes. The FPU registers (st0, st1, ...) are organized as a stack. When you load something to the FPU, everything else will be moved one location further away from the top (implicitly!) Some FPU instructions work only on the top, other allow the explicit parametrization with arbitrary FPU registers. Depending on what you do, sometimes F(N)INIT can be omitted. Real hardware will refuse to work more often than emulators, but it's always worth the try. Accessing memory (size) efficiently can be a real pain. The safest way is to reference absolute memory locations (f.e ) but that's two bytes more per instruction than referencing memory with [BX], [SI], [BX+SI], [BP+DI], [BP+SI], [DI] or [BX+DI]. When working with FPU and this classic approach of FPU communication, you have to design your codeflow to have one or some of these locations available. There are a few conventions which help you identify FPU commands. "i" stands for integer (WORD or DWORD), "p" means "pop stack afterwards", so FST means just "store" while FISTP means "store as integer, then pop the stack"
Instead of aligning horizontally with sub	dx,160 we can code this implicitly by moving our segment register ten units - that is 10 * 16 = 160 pixels - to the left (see Real Mode Addressing). With further multiple subtraction of 20 units - that is 320 pixels, we can shift the visible screen towards the top, to finetune vertical alignment. As long as this shift is no more than 4 lines ( 65536 / 320 - 200 = 4,8 ) there is no further visual impact. Instead of constructing X and Y from the screen pointer DI with DIV you can get a decent estimation with multiplying the screen pointer with 0xCCCD and read X and Y from the 8bit registers DH (+DL as 16bit value) and DL (+AH as 16bit value). The idea is to interpret DI as a kind of 16 bit float in the range [0,1], from start to end. Multiplying this number in [0,1] with 65536 / 320 = 204,8 results in the row before the comma, and again as a kind of a float, the column after the comma. 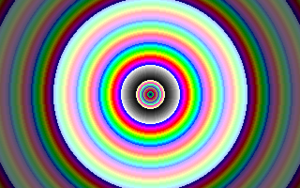 The representation 0xCCCD is the nearest rounding of 204,8 * 256 ( = 52428,8 ~ 52429 = 0xCCCD). As long as the 16 bit representations are used, there is no precision loss. The instruction at [SI] is push <word> and has the opcode 0x68 which is 104 in decimal. Combined with the fine tuned vertical alignment above ( ~4 lines) this results in (virtually) subtracting 100 for perfect vertical alignment. This is one byte shorter than sub dh,100. With the "Rrrola" trick above, we have the row number to be 204 at maximum, but also the column can't be greater than 256. This results in a wrong aspect ratio, but it can almost completely be fixed with this two byte instruction (+ one byte for the AAS instruction) : 256 * 1,24 = 317,44 which is quite close to 320. If aspect ratio is of no meaning to the desired effect, this three bytes can be shaved off. Many other tiny tunnel effects have been coded, so it is highly recommended to check out the documented source code of "Constant Evolution" by ryg/Farbrausch and the "Heart shaped tunnel" from Lord Kelvin, both with a size of 64 bytes. While "Constant Evolution" takes a slightly different route than the example here (classic FPU communication, classic X Y construction, sqrt(x²+y²) instead of using fcos+fimul), "Heart shaped tunnel" uses no FPU at all. 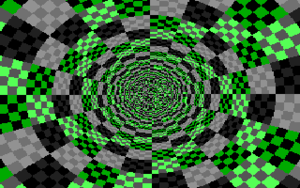 fimul dword [si] multiplies with a 32 bit integer dividend for the tunnel effect. The highest byte of this constant points to our code, to the opcode from or al, 0x13. This instruction puts 0x13 into al, and since there a lot of possibilities to achieve this, there is a direct way of changing the appearance of the tunnel with changing this instruction to one of the following : mov al,0x13, add al,0x13, xor al,0x13, adc al,0x13, sbb al,0xED or sub al,0xED. In this special case, the instruction can also be swapped with pop es to gain a further degree of freedom. Although it's the ultimate goal to not even use a single extra byte for constants, sometimes the required sequence simply does not appear in the code. In this case, a constant is needed to convert the angle from the range [-pi,pi] to the color space in a way that no gaps appear while stepping from 359° to 0°. In the last line at val: the value 160 in the comment is 32 * 5 where 5 is number of "spiral arms" the tunnel effect has. The 8bit shift (*256) is to increase precision. It turns out that 16bit precision is enough to get a decent "gap closer" for values obtained by fpatan. The location [bp+si] is used as animation variable, while both participatory registers are kept fixed (the value is 0x0A?? and therefor way above our code). Since we work with 16bit values and the top 8bit are the measurement in pixels, the instruction add word [bp+si], byte 23 allows for sub pixel precision in animation, while occupying 3 bytes of space. Depending on the target hardware, this value 23 can be increased/decreased to achieve faster/smoother animation. jmp 	short X-1			; *ODD* jump into "int 0x10"
Like before the mul di instruction triggers the overflow flag - and the carry flag - always but twice per frame. CL remains 0xFF unchanged from start, so adc [bp+si],cl effectively decrements the framecounter twice per frame. The dividend for scaling the arc is now taken from the location [bx], which is 0x20CD. Calculating the number of "spirals" backwards from this number (*pi*2/256/32) gives about 6.44 which is close enough to 6.5, so that the visual gap in the top is almost not recognizable - besides from the miscoloring which can be fixed by removing the 16 from and al, 16 + 8 + 4. The takeaway here is to study the modbytes of instructions that are very likely to appear in tiny intros, as well as using their constants as code. int 0x10 will almost always be in your code, so there is always adc byte[?? ], 8bit_reg too in between. Finally, you might have noticed that these tunnels don't "spin". For the cost of two bytes this can be easily added. add	al, [bp+si] before applying XOR in the last example would offset the arc with the framecounter and produce a spinning effect. For a coherent visual experience the sub palette selection must be changed to and al, 8 + 4, too. This page was last modified on 24 August 2016, at 14:18.